If you love Krita or want to pick it up then you already know it’s a great art program. In my opinion Krita is the best free Photoshop alternative out there with many of the same features: layering, blend modes, and custom brushes(among others). Granted the Krita community isn’t as large as the Adobe community so it’s tougher to find brushes. However there are some incredible sets online and they’re all 100% free. 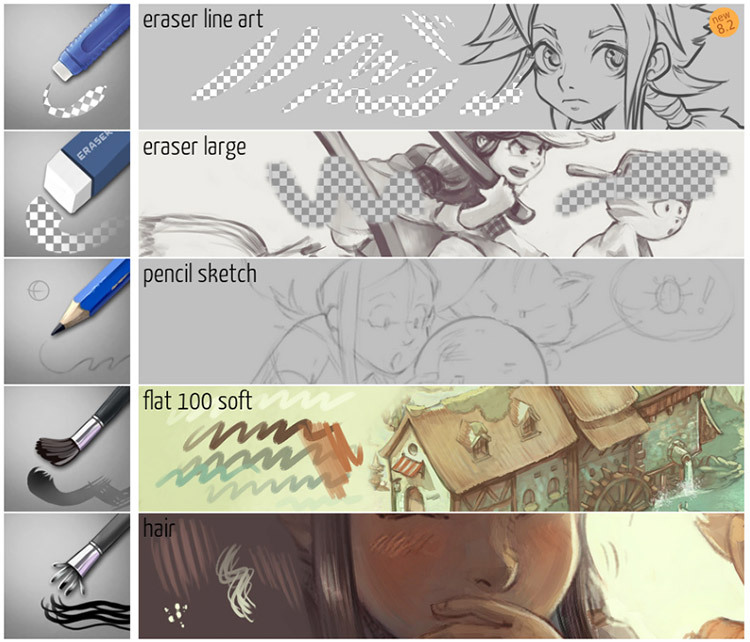 This list includes my top picks for the best free Krita brush packs. Whether you’re a Krita pro or someone who’s just learning the software these brushes will improve your digital art workflow tenfold. Artist David Revoy is well known in the Krita community. He contributes quite a bit to the project and he’s one of the few artists running all FOSS. That’s quite impressive! He’s been publishing a brush kit for years and the most recent version is v8.2(updated frequently). David updates this brush kit fairly often with new features, brush descriptions, icons, and new features/bug fixes. Especially as Krita gets updated. That means you always want the newest version if you can run it. And way too many others to list! 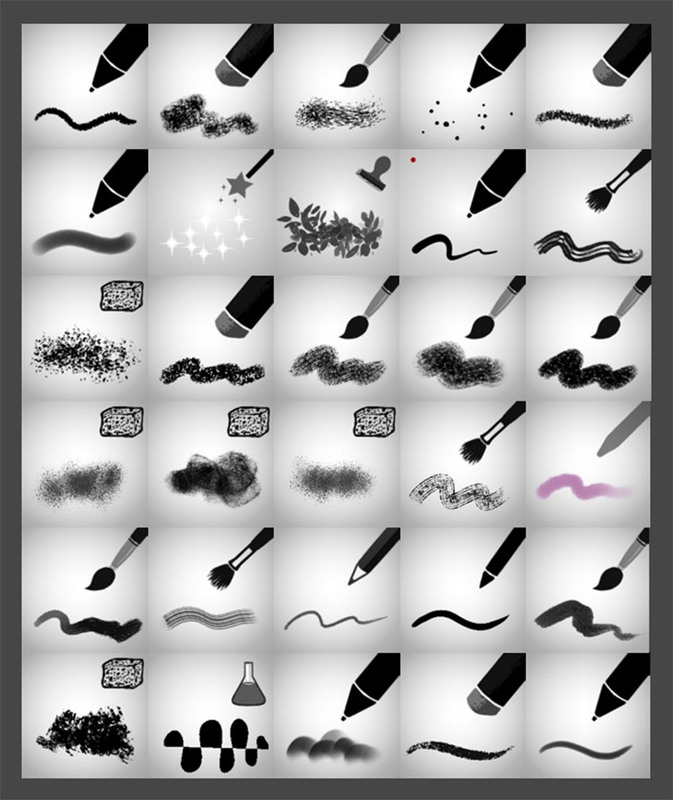 In total the pack includes 64 brushes so this is likely one of the best packs you’d ever want for getting into Krita. Take a look at David’s work on Patreon. He does all of that with his brush pack so if he can do that level of work in Krita I’d like to think anyone could. The newer Hushcoil Brushes are pretty unique and very detailed. The entire pack includes 280 total brushes with a lot of variety. You might notice this is all hosted on Gumroad, a popular marketplace for digital art goodies. But this specific brush set is available for free so any payments offered here are just donations. The brush set includes four bundle packs: Concept, Paintbrush, Pen & Pencil and the Basic set. These all have unique styles and really help to define a variety of digital drawing and painting work. Certainly worth a peek if you want a massive pack filled with hundreds of custom Krita brushes to wade through. I frequently mention the incredible GDquest team. They release free tutorials and design assets online to help aspiring game artists & designers create their dream projects. One such example is this GDquest brush pack designed exclusively for Krita. This is a freemium alternative to their game art brush pack that does cost money. But it’s not needed to get the pro brush set considering how much you get in the free version. The current bundle is in v7.0 and you can download the brush pack totally free from this page. It’s updated frequently with new brushes and bug fixes so check back often. And if you’ve never used brushes before don’t worry! There’s a small guide towards the bottom of that page showing you how to install new brushes on Krita. Digital painting is often the realm of cartooning, storyboarding, and web comics. That’s what makes this brush pack so darn fun. 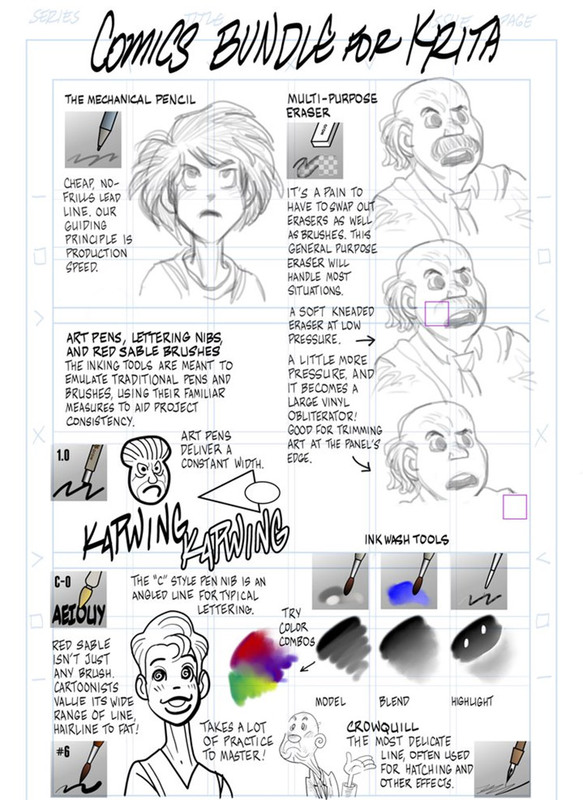 It’s designed to mimic traditional cartooning tools like pens and brushes for classic comics or graphic novels. Every brush works at 300 DPI so you can design work in high-def print quality or design for digital screens(or both!). 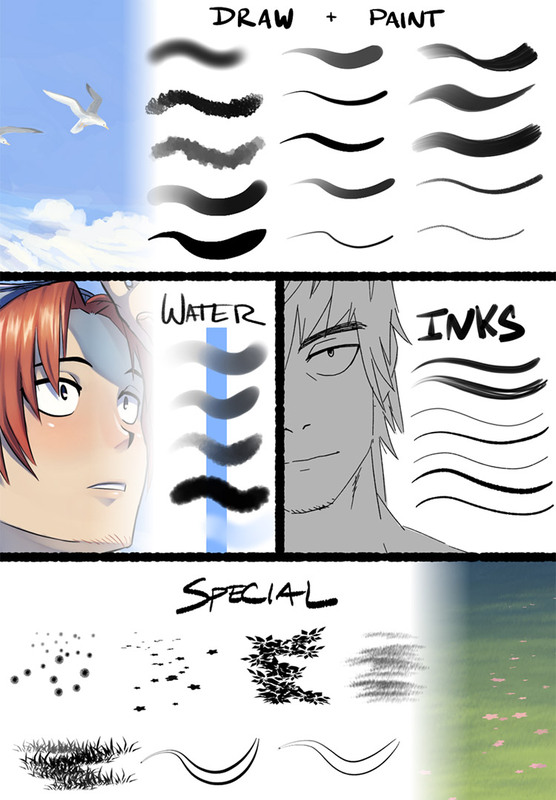 The main DA page has a small sample of the brushes you get in the pack—nothing major but definitely a nice selection for anyone looking to launch their own webcomic. Also for those who have never used DeviantArt before: the brush download link is near the upper-right corner of the screen. You’ll see a button that says “download” with a total KB file size underneath. 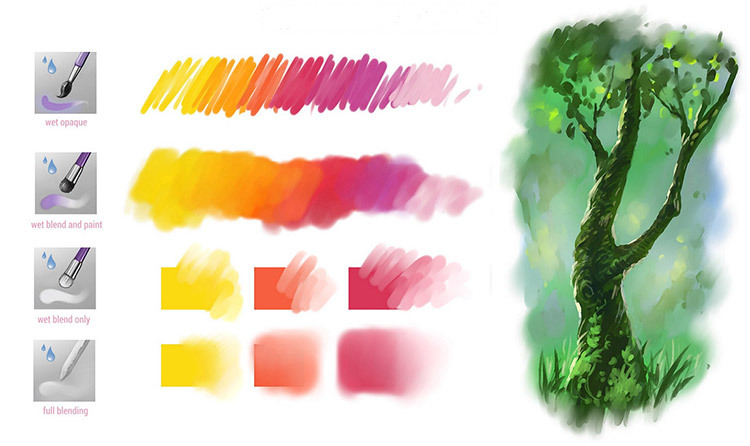 Here’s another great brush set released on DeviantArt by user radian1. As you can imagine, it’s got some nice stuff inside. Note the difference here is that you can’t download the brushes right from DA. Instead the creator has them hosted on Google Drive so you’ll need to visit that link and click “brushes” to download. The cool part is that Radian1 actually has a bunch of goodies in this pack. You’ll find custom patterns, gradients, and even workspaces you can download for free. This individual brush pack is mostly geared towards painting and it requires Krita v3.2 or later. Worth checking out if you’re mostly into digital painting or want to get into it. 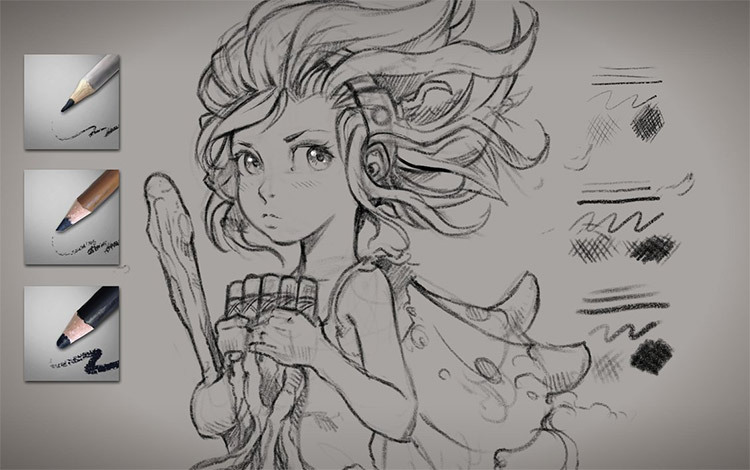 David Revoy pops up again with another brilliant Krita brush pack. This time it’s focused on charcoal pencil marks designed as custom brushes. Not everyone has a big need for this kind of brush set, especially if you don’t have a lot of experience with actual charcoal work. Still, this pack of 3 brushes definitely feels like a useful addition to any Krita drawing session. Easy to install and super easy to use in your digital drawings. The brushes range from super thin & accurate to very thick & painterly so there’s lots of room to play around. 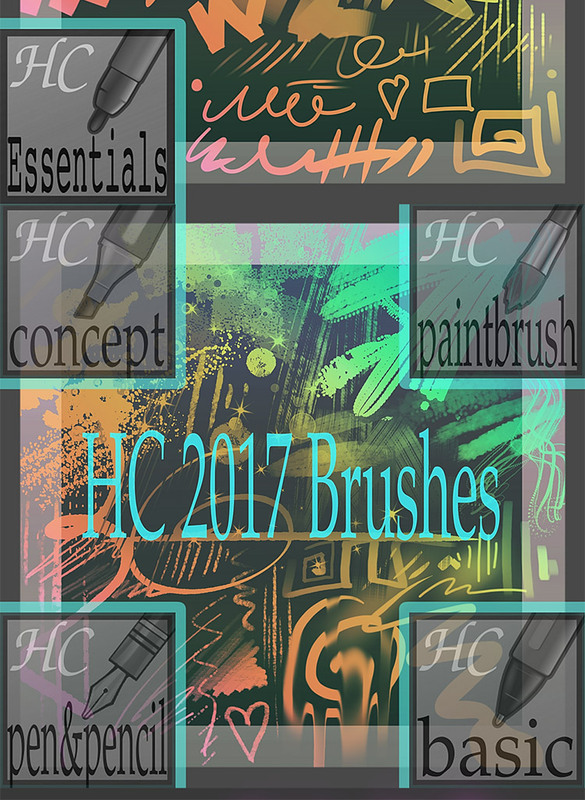 If you’d rather go for a set of painterly brushes modeled after real bristle brushes then take a look a this brush set. This is another pack from David and it’s also a small one. The brushes were designed for Krita 2.9 but you can run them on any version above that. Inside the pack you’ll get a handful of brushes that David often uses to paint the backgrounds for his webcomic series Pepper&Carrot. The real magic here is the blending styles for working with opaque colors that feel like real techniques for color mixing. Definitely a set worth adding into your Krita toolkit. With over 120+ brush presets and dozens of custom styles I really have to praise the Krita Modular Brushset for its ingenuity. This comes from DeviantArt creator GrindGod and the entire pack + demos is a massive download(just over 34 MB). It’s packed with some incredibly valuable brushes and it works with Krita 2.8 or above. 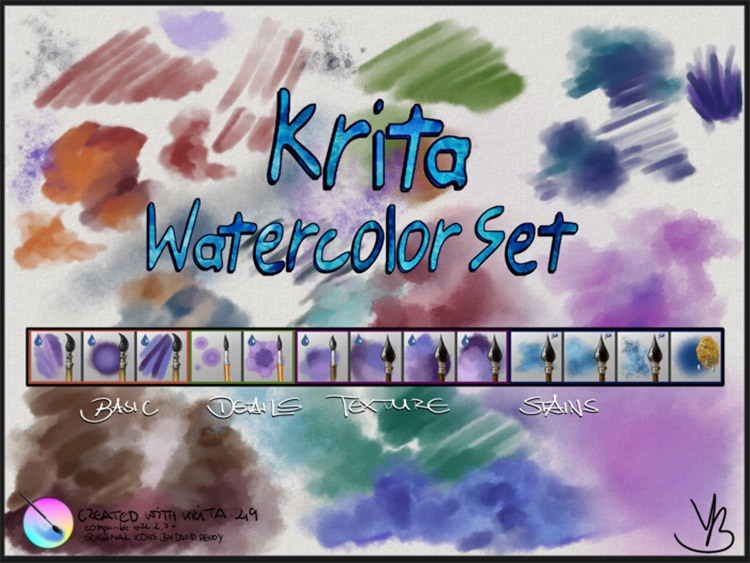 Now a new v5 set was released a little ways back and that’s compatible with Krita 2.9+. However that DA page doesn’t have any previews so it’s harder to see what you’re getting. Rest assured this brush pack has a little bit of everything. Form fountain pen styles all the way to loose worn-out paint brush marks, this is one brush set that I definitely recommend trying. It’s worth noting that the v5 does seem to have all the v4 brushes too, just with some updates & new additions. So if you’re gonna download the Modular Brushset I do recommend grabbing version 5. Digital artist Vasco Alexander Basque created a set of custom watercolor brushes just for Krita users. There’s a decent collection of brush styles here with some featuring dabbed/splatter brushes, others a little more refined and controlled. All of them feel true to the process of watercoloring. If you’ve never done any watercolor work before maybe try small exercises in Krita using this brush pack. It certainly won’t feel the same when using a tablet but you can get a feel for how the brushes work. The pack is free to grab from GitHub and it’s compatible with all versions of Krita 2.8+. Worth noting the brushes were designed fairly small with a size range of 30px-100px(mentioned in the brush pack notes). But you can still see good results at 200% or 300% above those size limits. Mumbai illustrator Raghavendra Kamath published a nice brush pack that’s been online for quite a while dating back to Krita 2.0. These brushes may be quite a few years old but they’re surprisingly versatile. That’s one of the main reasons they’re in this list: I still think they’re valuable to newer digital artists. Inside you’ll find a handful of brush styles like sponge brushes, custom pens, and even a few stamp-style brushes. The entire set was released as open source on GitHub so that’s the best place to download a copy. I haven’t found any new updates from Raghavendra’s brush set, but even this older edition is worth trying just to see what you think. I just recently stumbled onto the Jackpack Krita brush bundle that’s fully up-to-date with the newest upcoming Krita release(4.0.0). All of the brushes will work just fine on older versions but if you’re running v2.8 or below it’s better to test them first. All of these brushes were designed with pixel-perfect strokes in mind so you can resize them to your needs. But not all brushes support mirror symmetry so if you use that a lot you’ll have to play around to see what works. You can grab the whole brush set from the Gumroad link and once again it’s a free download. If you want to offer a donation that’s fine, but you can nab this awesome brush set without paying a penny. 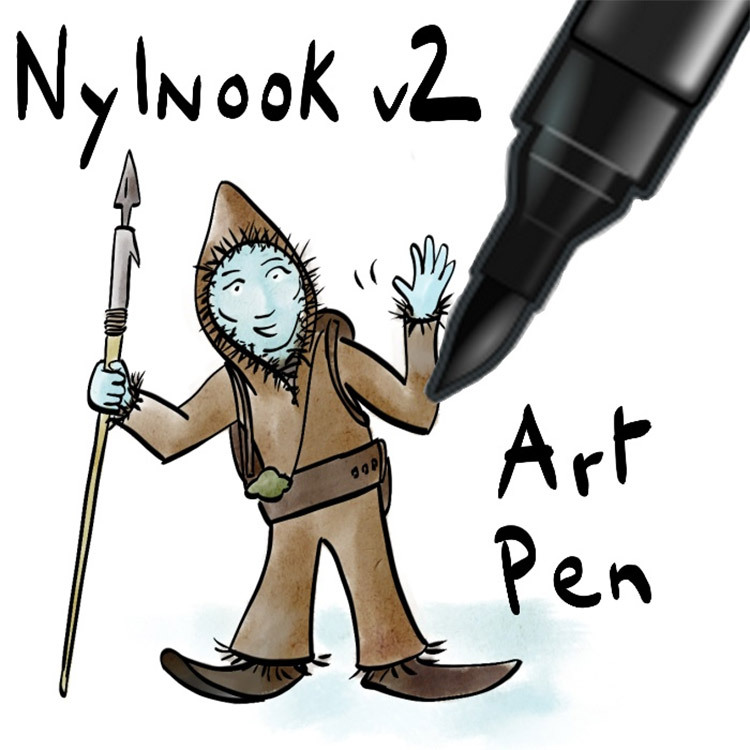 So this Nylnook brush pack is just awesome. 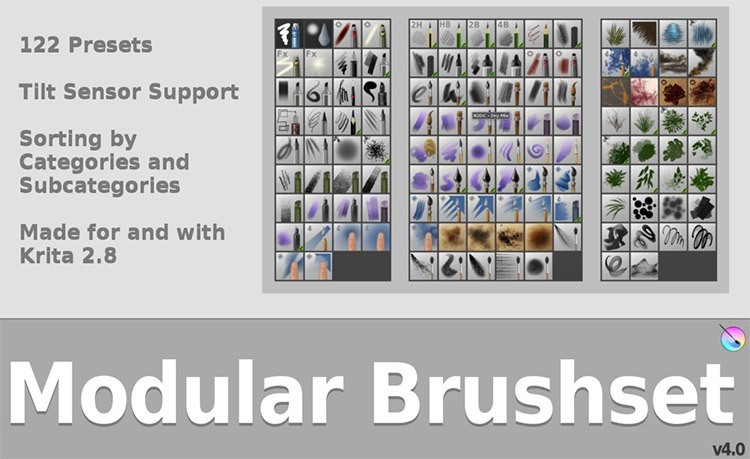 It’s a lesser-known pack offering about 36 brushes for digital artists. Some of these brushes mimic traditional pen & paper while others are geared towards digital work. The full pack was released for free on the open source platform GitLab(visible through Framagit). Nylnook’s brush set was updated to v2 fixing a few bugs and adding a few new brushes. The v2 update is absolutely worth getting but it requires Krita 3.0.1 or higher. You’ll find full details about the brushes, the techniques, and the install instructions on both the Framagit page and the original blog post. I do think this pack would be great for beginners but it’ll take some time getting used to it. Give this pack a shot to see how it feels but if you’re not a huge fan then try David Revoy’s brushkit as an alternative. 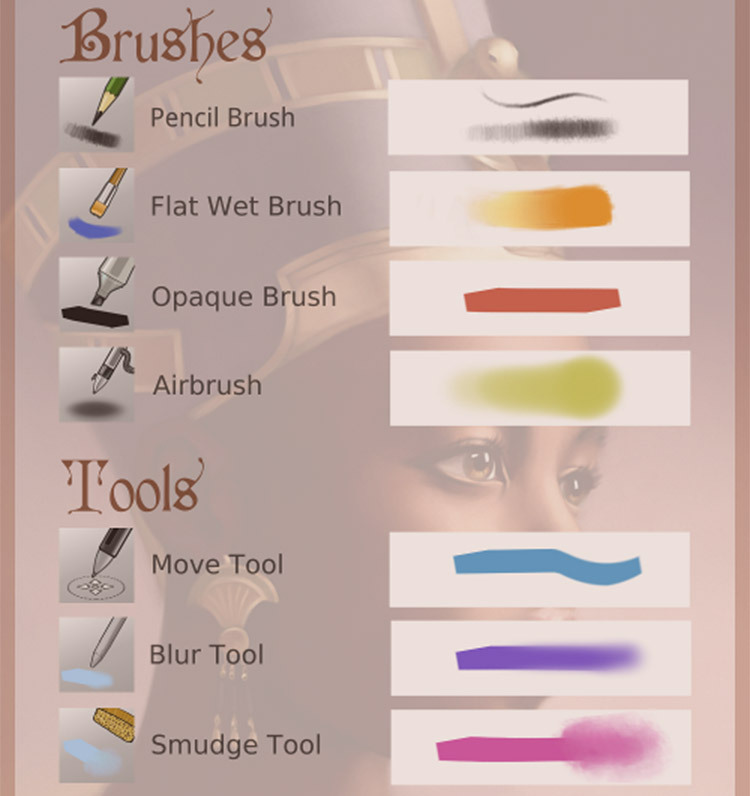 Here’s a very small and simple set of brushes created by DA user Aliciane(Elésiane Huve). She works as a freelance illustrator & digital painter who often sticks to Krita for digital art. This brush pack was derived from David’s pack but it does have a few changes that makes this worth testing. Notably certain brushes have altered line widths, opacity sensitivity, and line cleanliness when making marks with more pressure. You can get the whole pack working with Krita 2.8 or higher so it should run smoothly for everyone. If not you should really update your Krita! Some of the more unique brushes in this set are the smudge brushes & a custom move tool using the brush pack. It comes with 8 brushes in total and you can download the full pack on this page. So Aldys Brush Pack has been around for a while since it was originally released for Krita 2.3.1. It might be one of the oldest brush packs in this entire list. But many of these brushes are incredibly basic making them worth a try if the other packs feel too complicated. That goes double for newbies who are just trying to learn the Krita software from scratch. This pack includes a little bit of everything from pens to airbrushes, oil brushes, smudged graphite and even some pattern brushes. The biggest downside here is that these brushes are so outdated. If you do professional work then I highly recommend sticking to some of the newer brushes mentioned earlier. I only mention Aldys set for anyone new to Krita, new to digital painting, or as a simple alternative to other pattern brushes. 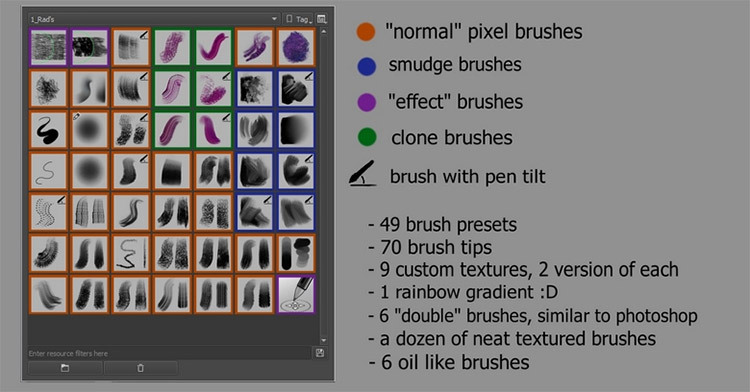 My personal recommendation for the best Krita brush set has to be David Revoy’s brushes. That pack is constantly updated with new features & new brushes to support the latest version of Krita. Not to mention his brushes are super high quality so you’ll have no trouble making professional-level work. But have another look over this list and see what you think! New Krita brushes come out all the time so this is far from an exhaustive list. Although I think these free brush packs offer a great starting point to improve your Krita brush library.